You'll enjoy the spacious deck, lots of sunlight and windows. Step out to your rocky beach and listen to the waves. Bay Breeze is a lovely vacation rental home in Hovland, MN on Lake Suprior Bay Breeze has 2 bedrooms, 2 bathrooms, and has garage parking available. Located on a private 450 stretch of Lake Superior Shoreline, Bay Breeze is quiet and private. Enjoy incredible views of Lake Superior from many rooms in the home, as well as in the yard and on the deck. The living room has plenty of space for everyone to take a seat and spend time together. Watch a movie on the TV and light a fire in the fireplace. The living room and kitchen area are semi-open to each other through a doorway. The living flows nicely into the kitchen and dining room area. The kitchen at Bay Breeze is spacious and has all you need to prepare your meals during your stay. Enjoy full sized appliances and even a dishwasher The kitchen area opens into the dining room area. Enjoy your meals at this unique dining table. While you prepare your meals and while you dine you can enjoy these great views of Lake Superior. The lake-facing master bedroom has a unique, custom wood bed frame and Sleep Number mattress. The master bedroom features an attached master bathroom. You can also enjoy the massage chair in the master bedroom- a guest favorite Enjoy Lake Superior views as you lie in bed, or open the window on the summer nights and listen to the waves. The spacious master bathroom also has his and her closets- great for unpacking and enjoying an extended stay vacation. The bathroom features a walk-in shower, two vanities, and a jetted soaker tub. The bathroom is located in its own water closet so you have plenty of privacy while others get ready in the morning. The guest bedroom also features a beautiful custom wood bed frame. The four poster bed will make you feel like you are sleeping amongst the trees. The guest bedroom has a futon as the addition sleeping area so this home can accommodate up to 6 guests. The guest bedroom is also divided to the toilet is in a separate area, allowing others to get ready in the morning. The back part of the guest bathroom also features a shower/tub combo. Look for the Bay Breeze Bear as you drive up Highway 61. When you see him you`ll know you`ve arrived. Grab a seat on the porch swing and enjoy the sunrise over Lake Superior. The deck features plenty of room for everyone to gather and enjoy the outdoors. Bay Breeze features both a gas grill and a charcoal grill so you can grill using whichever method you prefer Just steps away from Bay Breeze is this fire pit- perfect for roasting marshmallows and sharing stories. Gather around the campfire. The property around Bay Breeze includes many short trails that bring you back into the woods surrounding the property and along the lake front. Enjoy exploring At Bay Breeze you are just steps away from Lake Superior. Enjoy the serene, peaceful surroundings. During low-water there is a small beach area, but this is not accessible during high water times. Wherever you are at Bay Breeze you are never too far from Lake Superior. Located on 2 acres in Hovland with 450 feet of gorgeous Lake Superior shoreline, most everything about this vacation home rental is anything but ordinary. 1,383 square feet suitable for entertaining family and friends, there's plenty of space with 2 bedrooms, 2 full bathrooms, and numerous amenities - including jetted tub and a massage chair for those worn out from a long day of hiking. All located on one easy-access level. Outside, the deck boasts a great lake view and a swing to enjoy it. The fire pit is a great place to sit and listen to the waves. The shore curves into a cove for swimming or skipping rocks. Beautiful log beds in both the master suite and guest room offer a good night's sleep. During the day, relax in the hammock by the lake. We just know there will be sighs of contentment the minute you walk through the front door. If you are up for an adventure you will have plenty to find just a short drive away! Head to Judge CR Magney State Park. Enjoy a challenging 1-mile hike to the infamous Devil's Kettle. Pigeon Falls and the Canadian Border are also just a few miles away and a great location for hiking. 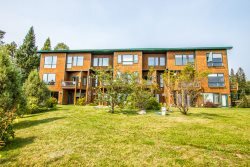 You will find the home surrounded by miles of mountain biking trails and cross-country ski trails in the winter. Bay Breeze is also about 25 minutes past picturesque Grand Marais, home to many locally owned and operated shops and restaurants. Chicago Bay Deli and Naniboujou Restaurant are convenient stops to eat just a few miles from the home. The cabin is only one mile from Horseshoe Bay boat launch. Pets are welcome with prior approval and an additional fee. 2 pet maximum. This property allows small dogs (under 30 lbs) only. They were helpful via email! Lovely property! Having a garage with a heated slab is fantastic (though it is unusually short - if you have a full size SUV or truck it is not likely to fit). Ceiling fans in both bedrooms work well and are quiet. Dimmer switches on a LOT of lights as well! Will definitely be looking at staying here again in the future! The team was great. They answered any questions I had throughout the process. Of course they always have, which is why we keep coming back to CVR. We had a great stay. It is our second time at Bay Breeze. We love the North Shore and always use CVR for a place to stay. Bay Breeze is an exceptional home to stay at. The view is great, the amenities are fantastic and even though the weather was not the best we didn't care, we could sit in front of the nice fireplace and enjoy the waves crashing on the shore. The home is a fabulous place to stay. This is a beautiful property with really pleasant amenities. The cabin is updated but still had a lot of character and "up north" feel. The only recommendation that I would have is to trim the area between the deck and lake. It would be nice to be able to easily access and see the lake shore from the backyard area. Cascade rental was fantastic to deal with. Bay breeze was a wonderful home. Paths to lake a little wider maybe. Neighbors dog was over in our yard a couple times, pooped in yard, which I cleaned up. Luckily our dog did not see him as she doesn't care much for other dogs. Other than that the stay was great! To us, this is a year-around home, more than a cabin. It has everything a home has and then some. It was immaculately clean, everything as advertised, comfortable, quiet, bright, and the cabin decor was fun to look at. Everything worked. There is no beach, and swimming would be difficult if attempted, but no worries, we knew Lake Superior is COLD way up the north shore at this location, and didn't plan to swim. The weather was enjoyable... cool air, warm sunshine, cool nights for sleeping. Love it. The stars were dazzling, the lake changed color every day, we had a large, bright rainbow right in front of the cabin, we saw a tall sailing ship go by, many fishing boats, it was a great few days. Bay Breeze is a great retreat that has just about all you would like for a great vacation or long weekend. We have been there twice and thoroughly loved our stay. It would be great if the owners would get internet service & at least have outgoing 800# telephone service. I wold also suggest that at least a 15 - 20 foot area in front of the deck have the natural weeds & plants removed all the way to the lake which would give a superior view. This would make sitting on the deck even better and then you could take chair up the edge to have an even better experience for lake watchers! However, this property warrants an excellent rating. This is our second time to stay here (2008 and 2016). The house is a great place to get away from people, cell phones, internet, etc.. There are many great things to say about this house and the location. Waking up and looking out the window at the lake is awesome. The den is cozy and relaxing (great windows and lighting). This is our second year at Bay Breeze and it was a great place to spend a week at the north shore. This home has everything one could want and more. It is secluded with its own beach front. The fire place inside was a little smokey but the firewood was in the garage and stayed nice and dry despite the many rainy days. We enjoyed being further north and further away from the busier parts of the shore. There are still plenty of things to do around Hovland. Loved everything about it. A great retreat to get away from the business of everyday life. Try the pizza and cinnamon rolls at the Old Chicago market. You won't be disappointed. This is an awesome property for 2 or 4 people! Bay Breeze is a beautiful home. It is warm and cozy. Loved the massage chair, swing on the deck, great shower, and it was nice to have a wash and dryer. What really liked about Bay Breeeze was it was had lots of sunlight and windows. It was fun to go on the beach and listen to the waves and read. The staff were very freindly and helpful in finding a place to meet all of my family needs for a wonderful vacation stay.